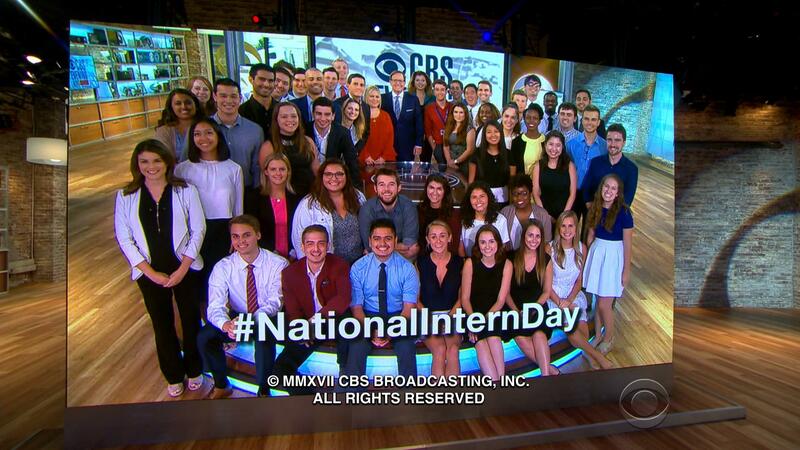 Are you interested in a college internship at CBS News? This is an educational program designed for college students who are juniors or above and are interested in pursuing a career in journalism, broadcasting or production. Each student is selected and assigned on a first-come, first-served basis. You choose the city; department placement is at the sole discretion of the Director. Juniors, seniors, and graduate students are eligible; however, due to the limited number of positions, preference is given to those who are entering their senior year. Students majoring in journalism, broadcasting or communications are preferred; other majors will be considered. Participants must have a passion for news, excellent written and verbal communication abilities and a comprehensive knowledge of current events. A 3.0 GPA or above is recommended. Students must be able to meet the minimum time commitment: full-time during the summer; at least 20 hours a week in fall/spring. Recent graduates are not eligible for this program. Applicants must be legally authorized to work in the United States. Verification of employment eligibility will be required at the time of hire. Visa sponsorship is not available for this position. Yes, CBS News compensates each student an hourly wage. CBS News does not require students to receive college credit. Students are solely responsible for coordinating and meeting the credit requirements of their college/university. CBS News Interns on the set of "Evening News"
Go to CBS Careers, search 'CBS News Internships' and apply. Due to the high volume of applicants, the office cannot respond to application-status inquiries; complete application packets are reviewed and qualified students are contacted directly for a video or in-person interview, depending on applicant location. "48 Hours" (NY) A CBS News magazine that goes behind the headlines to investigate baffling crimes, heartless scams and compelling real-life dramas. "60 Minutes" (NY & DC) A CBS News magazine with investigative reports and features focusing on people and events in the news and behind the headlines. CBSN (NY & DC) CBS News' 24/7 digital streaming news service. It's always on, always free, making CBS News' original, high-quality reporting available wherever and whenever you want to watch. "CBS This Morning" (NY & DC) One of three live national morning shows that reports on a variety of topics including general news, business, consumer affairs, entertainment, health and medical. "CBS Evening News" (NY & DC) A nightly broadcast anchored by Jeff Glor that covers breaking news reports, features and interviews by CBS News correspondents covering events throughout the world. "Face the Nation" (DC) A weekly broadcast moderated by Margaret Brennan that discusses current national affairs with the principal newsmakers of the week. News Marketing (NY) The unit that produces on-air promotion for television, radio and print for all network news broadcasts. Newspath (NY & DC) The newsgathering and distribution unit that gathers footage, edits and redistributes video to affiliates about national & international news, weather, sports, health reports, business & consumer news. "CBS Sunday Morning" (NY) A weekly broadcast reviewing events of the preceding week, covering the world of fine art, music, nature, sports, science and Americana. Weekend News (NY & DC) The weekend edition of the "CBS Evening News" broadcast. It features reports and interviews by CBS News correspondents covering events, trends and issues around the world.